There’s nothing like the first time you see them live and on stage! No jittery camera video from row Q. No people talking as the camera rolls. No song ending early because someone is out of time or iPhone space! There they are…in front of your face! They are more beautiful than you even dreamed they would be. No matter how many times you’ve listened to their Cd’s, they sound like something from heaven you’ve never heard before! Then the Meet and Greet happens! Many of you will be attending your first Meet and Greet and have asked about the process. I am no expert on M&G’s, but I’ve attended six of them and can tell you what I know. Let’s start with walking in the venue door…Look around and ask at the ticket booth where to go to wait for the M&G after the concert. Usually you stay around your seat while the rest of the audience leaves. A staff member will tell you where to congregate from there. It use to be that there was a table set up in the lobby as you walk in and there were gifts for you, like a tote and scarf with Il Volo written on them. Lately there hasn’t been a table. In fact, many times they don’t have merchandise to sell. Take full advantage of this if they do! I have 16 t-shirts. I only wear the one’s that have a twin. Find your seat – there are staff to help. Also, if you have a walker or etc. a staff person will be there to gently assist. Oh come on Allene. You can smile bigger than that! Well..maybe not! The Concert: Not what this post is about. To answer one on-going question…Taking pictures during the performance is a rule of the venue, not the Il Volo Team. Piero personally told me this, he said pictures do not bother them at all while they’re singing (you may pause here because the “personally told me” part impressed you so much.) Best I remember of the seven concerts I’ve attended three did not allow photo’s. The concert is merely two hours of heaven and you won’t be crying when it’s over. Because…YOU HAVE MEET AND GREET TICKETS! You will have about a 30 minute wait while the Guys shower and dress in more casual clothing. Usually you and about 20 of the hundred or so M&G ticket holders are given a paper bracelet ID and are led into a space/room and there THEY are! Allene, Mary B. and Jane. I think you know the others. You can tell that Jane doesn’t mind the line up! Gifts for Il Volo: I don’t take gifts. Many people do and some are amazing! I wonder what they could possibly do with them all, plus I think they should give me one. You are usually asked to put your gift and purse on a table before greeting them. Now you get to watch the people in front of you greet Gianluca, Ignazio and Piero. This is so fun! Surely you don’t think your going to be the only one who looks like a star struck fool, do you? You are now a little shaky, but hang in there. Remember this? Got caught going for an extra dimple! I gave him fair warning. The Next Moment: Now it’s your turn! You may go up to them alone or with your group. You have been waiting for this moment for a long time! Take it! Hug each one of them and/or shake their hands. Cheek kisses are also in order. Try to remember what you planned to briefly say. Of course they’ve heard all of the praise words before, but not from YOU! And they will love hearing them. By-the-way, they hug back really well! We all saw them on stage with our gift of the Book last summer, “Love, From The Flight Crew”. Let’s ask them how they liked it. Maybe they will remember your greeting! While Mary and Loretta were getting ready for our group shot I had a conversation with Gianluca. Yeah, I knew Ignazio was listening and touching! I must take a moment to talk about SMELL!!! The guys have just showered and applied cologne! Take a sniff! After a hug, if you’re lucky, you can still smell them on your clothes. Happened to me in Chicago. 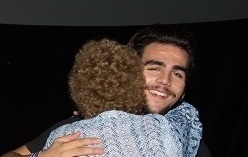 I could smell Ignazio for hours. Alas, by morning the smell was gone. I swear to you I know someone who, as soon as she got back to her hotel, ripped off her blouse and put it in a plastic bag to preserve the smell. That’s creepy. I, on the other hand, ordered Acqua Di Gio by Georgio Armani (Ignazio’s scent) from Amazon. Not at all creepy. Bring one thing for them to sign, a CD cover, a picture from a prior concert or M&G, your Flight Crew badge. I’ve had them all signed. During one M&G this year I will ask them to autograph the “Grande Amore” CD cover. Don’t worry, they will each have their own permanent Sharpie in hand. Take your time, but don’t overstay your welcome. Remember, they may not love you quite as much as you love them. They Don’t mind “set-ups”. In fact they think it’s fun… Like when Linda couldn’t make the concert. They were happy to do this. It has much meaning for me now. The Boys were important to Linda and her family used this picture at her memorial. Or when I “pretended” to steal Ignazio. They are such good sports. He may look scared, but he is holding both of my hands with one of his! Be sure to have the friend behind you snapping pictures with THEIR OWN camera, as fast and as many as possible of your moment with the Boys. When your time is over, turn and do the same for your friend. When it’s your turn a staff person will take your camera from you and snap a shot or two for you. Also, usually there is a professional photographer who will take two posed pictures. After you pose, it’s your time to leave. (Yes, you have to do it eventually) The photographer will hand you a card with his email address. In a day or two you can log on and buy the pictures. Last concert season I think they were 10 or 12 dollars. Didn’t matter…I bought them. 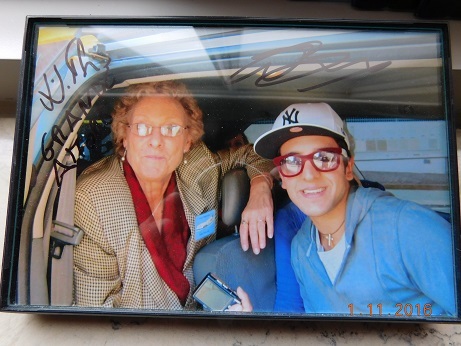 At this M&G Mary B. gave Piero a 21st birthday gift. I love the expression on all their faces when he “blew out” the candle. Do not forget your Flight Crew Badge! It is distinctive enough for the guys to recognize and they will usually smile and/or nod at it! Yay! Afterwards is a good time to look around to see if Barb or a parent is around receiving accolades. You can tell if they seem to be approachable at the time or if they’re working. If approachable, be quick while telling them how grateful you are that Il Volo is in the world and that you think they are taking good care of them. Got this beauty of Mrs. Genoble and Barb at a M&G. I also have one of me with each of them! Then you leave….. You forget half of what you said and 75% of what they said, but it was a moment you will never forget. Well there it is. That’s all I can remember for this post. Please keep in mind that it could all be different at your venue. What I have given you is the usual way as I know it. I’m sure I’ve left out important things and others will give you more clues in the comments below. We’ll be looking forward to seeing your pictures, video’s and stories! One last shot. You all know this one. It’s cropped from a M&G in 2014. Yikes this is long, but so fun to have relived my own memories while writing! Thanks Loretta. You’ve been to as many M&G’s as I have. What have I left out? Very well and groovy Marie ! ! ! Oh Zdena! I love the word “groovy”! Just never expected it from you! Not only do you know regular English you know slang too! I’m impressed! Dorothy, I strongly advise taking the walker with a seat. It’s been my experience that there can be a lot of standing in line and the seat would be most welcome. I know you will have a great time, especially now that you have Marie’s wisdom to guide you. Thanks Marie for posting my M&G photo taken on 8/27/13 at the Sleeptrain Pavilion in CONCORD, CA outside San Francisco. I have to make one small correction Marie, and that is, you posted that I’m the one in the middle which is not correct. That lady is my sister Norma. I, on the other hand, is the one bold enough to hold that gorgeous Gianluca’s stomach (he had his arm around my shoulder). They were beautiful. They were funny and they were very sweet. Ignazio said “hey, I remember you two in the front row. You were very loud”. Oh and yes, their scent was incredible. While we were in line to go into the pavilion, a young woman in front of us was with an elderly woman with a walker. I was telling my sister how much I love IL VOLO and that Gianluca wass my personal favorite and that he was so romantic handsome etc. The elderly woman turned around and said to me ” you can have him after I get through with him”. Her daughter was shocked and said “Mother, my goodness”. I hugged her and thanked her for her thoughtfulness. Marie, can you post a picture of the Flight Crew Badge please? I don’t have one and I would like to make it so I can wear it at the Las Vegas buffet and concert. See you then. Prese, how do you like the caption now? Cute story. Il Volo fans are nice people. They have to be..look what they listen to every day. For the Flight Crew Badge, go up to the top of this page. On the left, in purple just under Our Logo it says “Flight Crew Badge”. It is there in two sizes for your convenience. I should have put that in my post. Thanks for asking. Marie, What a lot of good advice. I think that all going to a M&G should print it out to review frequently, especially right before the event. Thanks Mary… Especially coming from you. I know you’ve been to a few!! Good advice on the walker. Besides, you never know when a friend may need to borrow it! A great post as always, Marie!! Thanks for posting my M&G pic from the Gibson 8/28/13! It was my 85th birthday! They sang Happy Birthday to me, I was on Cloud Nine for weeks! Let me warn again that you very likely may have brain fade & can hardly get a word out of your mouth!!! I had taken Gianluca’s hand & told him my late husband was Italian!!! He asked where he was from & replied it was a beautiful area! That was a wonderful M&G as we were not rushed along! Have 8 beautiful photos that the photographer took! I hope all our M&G’s are pleasant this year!!! I need Flight Crew badges also!!! Grande Amore to all this Mon morning!!! If you can’t find it or print it Tippy, let me know. I see the badges but when I click it on, I see the pic but not the download link. b2g147, I have emailed you. Hey Rose Marie, Yes, you may purchase a lanyard just about anywhere. Walmart usually carries a variety of colors. Pretty inexpensively too! The name badge holders (small one) I found at Staples, an office supply store. There is no need to laminate either one. Ignazio will be fine. He has to be. Rose Marie – just curious, where did you see people concerned about Ignazio? Last I saw on his Instagram was his adorable new puppy? He looked very happy!? Tippy, just copy and print should work. There is no link. I go to an office store, Office Depot, Staples, etc, and have them bring up the site (ilvoloflightcrw.com) and print it. They have a better copier with better color saturation than I do. I’m sure they will be happy to sign your quilts. Still?? Your so smart! And here I was trying to keep you incognito. LOL. Sorry Laura, I had to show someone else who’s as crazy about that smell as I am. Love Ya! You didn’t!! You did???!! Holy Smokes you’re a die hard fan!! At least you didn’t rip clothes off one of them!! Or knock one of them over and jump on him! I’m staying away from you!! I told the parrot what you did and he fell over on his back laughing hysterically!! Rose Marie, I think part of the reason I love HIM so much is that he does, occasionally, take off those wings! I like a little “bad boy” with my music! Have a great time at your M&G!!! Rose Marie – yes, Ignazio does have a devilish side sometimes! Lol! Loved the reminiscing here…Marie – I wondered about that kiss? I watched it on the video and he didn’t flinch a bit – wondered how he did that? 🙂 The one thing I forgot to do was “sniff!” Lol! I will definitely remember it next time. But it is so true, it happens all too quickly and you don’t remember most of it – thank God for videos and pictures! Regarding Ignazio’s “scent” by Armani…quite by accident, I picked up the “ladies” version of the same scent right before Christmas at Macy’s – they were offering a buy 2 get 1 free special with the little rollettes. I literally didn’t realize it til now that it was the same scent! It’s called the same thing, but with an “ia” on the end – gio-ia. It smells heavenly also with notes of jasmine and I love jasmine! Not too expensive – around $20. Also, another hint, try to remember to look into their eyes when they talk to you! Of course, you won’t remember what they said, but you’ll remember their eyes! Didn’t know there was a female version of “Gio”. I’ll find it! Interesting how you picked it out and didn’t know!! I love it, but looking into their eyes makes my knees weak. I remember looking deeply into Gianluca’s eyes. It was amazing! Just writing that made my heart beat faster!!! I am so hooked!!! Yep! A video! Sharon and Emilia picked up a lot. Don’t remember who got you? It’s on my Facebook page somewhere. I’ll try to find it and post to your page. Glad you found the perfume. There have been venues that are connected to a PBS station; where the M & G tickets were only available to PBS members. I don’t know if this is the case here, but if it is I think you are out of luck. Marie, you mentioned everything but my problem, brain freeze. Whenever I found myself in front of these young men I love so much, whatever I had planned and practiced over and over to say to them went completely out of my head. I know I said something, but what I will never know. The hugs I do remember, but darn it, I always forget to smell them. P.S. I forgot to ask the name of Ignazio’s scent. Or rather the female version of t. I know it’s Armani, but that’s all I can remember. According to Jana It’s exact the same name as his with an “ia” at the end, “Acqua Di Gioia for Women”. Found it on Amazon. I can see the brain freeze in your picture above. Looks similar to my face everytime! Oh I am really praying that the venue in San Diego is much nicer than the one in Saratoga, CA. In Saratoga , they allowed no photos during the concert and the M&G was a werid funky dimlly lit room. There was no professional photographer. There was this weird french can-can girls painting on the wall behind the guys. This old grump kept telling us to keep moving, keep moving. No table for my purse! AAIIEEE! 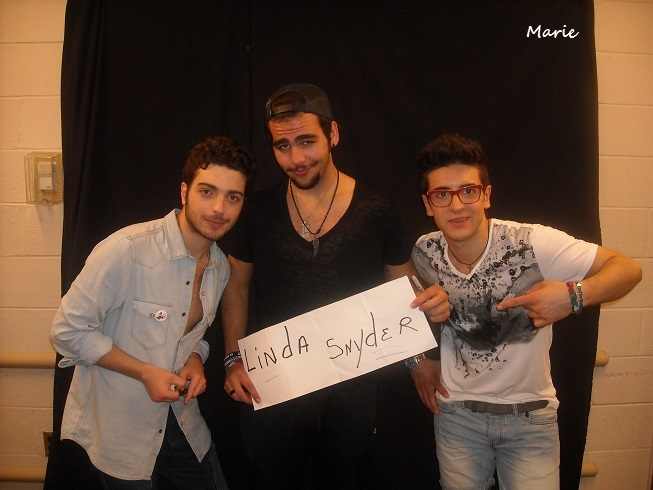 There they were!, Well there was Piero and Ignazio, someone was hogging Gianluca’s attention! While I never thought to kiss Piero’s cheek, it didn’t stop me after our hug for me to put my hand directly on his bare chest. Mmmm. This year I want a closer look at his hand. Ignazio scared me, which is why I think he’d make a wonderful pirate! But I have special words for Ignazio this year! MY hope is that someone will take photos for me since I will be alone. Eeeeeeee!! Oh and I WILL be kissing Piero this year! Arrrrrr! Ditto for the Saratoga CA M&G–disappointingly treated by handlers. Then we talked to the guys, and everything else vanished–they were wonderful! I wish we had had the advantage of a professional photographer (and nicer staff). During the concert, an usher called out someone for taking a picture. Marie,what a great post! It will be my first meet and greet and concert in Las Vegas. I got my meet and greet ticket with P.B.S. In Las Vegas. They told me they only had 10 ticket’s to sell, so I was lucky to get one of them. I don’t’ pick up the ticket until the day of the concert, and even though I know which section I’m in (Floor 103) I don’t know the seat number yet,but it’s supposed to be premium seating. Jill, you will find it’s a wonderful scent, even if HE didn’t wear it. A little costly too. I think it was eBay (maybe Amazon) that has a sample size. I didn’t do the M&G for Albany. I’m prone to unpredictable behavior at the best of times and didn’t dare chance damaging the Flight Crew’s stellar reputation by going anywhere near our “Precious Treasures.” So after the concert I will slink off into the dark of night without having met them! Admiration only from afar, I’m afraid. Alas! Thank you very much Lynn! You are too kind. Ummm, Miss Unpredictable Behavior, Just so you know…it isn’t imperative that you to wear the Flight Crew Badge to your concert. Some pretty jewelry would be nice. Just sayin.. I have a beer can pull tab and wine cork necklace I made in Crafts Class at the Asylum. Maybe I could wear that! Don’t forget a parrot feather or two. It’ll jazz it up, color-wise. If anyone needs more help to have a successful “Meet & Greet” you might want to check out the above link. I am checking every sight out but I know myself and I will revert back to my ‘act dignified” pose which does not do much for and ‘intimate’ meeting. . My daughter Kim who will be with me is one of the people that can strike up a conversation with anyone. I just hope she will not take over and tell the boys ‘my mother is crazy about you but just went silent from fright”. No matter i am going if it is in an “URN”. At 80 and at the moment having to deal with some issues I told my kids to get me there one way or another and plunk me in the appointed seat. Thanks, Marie, for the advice and info! Vegas will be my first M&G and I am already practicing my speech!😀 I’m SURE when the time comes, I’ll probably make a fool I of myself and blabber something unintelligible or be tongue tied! My husband is nearly 79 and I’m 73, but we both absolutely LOVE these young men and can’t wait to meet them! Anna, I’m sure they will be honored to meet both of you. Tongue tied or not! Thanks again Marie, for more helpful advice regarding the whole Meet & Greet experience. My first concert and M&G are quickly coming up in mid-February and I think that I am now fully prepared. After considering all the wonderful tips and advice from this site, I’m going to treat this event as if I had just run into a group of old friends that I haven’t seen in years and that we only have a minute to catch up on life. The more that I tried to find ways to idolize them and to think of compliments and accolades, the more unnatural the whole thing sounded to me, so I’m just going to stay calm and cool and collected and try to treat them as “friends” and not as “superstars”. That’s just my personal approach; I’ll tell you all how it turns out. You have the right idea, John! I’ll try to do just that. Thank you for the advice. I would, most of all, like for them to be my friends. Thanks Marie for the “tips” for M & G’s, I will read it again and again, in hopes of remembering enough to make it through with some sense. I’m going to my first M&G at San Antonio TX (I’m from Dallas & may go to Dallas concert too). So excited and I have purchased small for gifts for them-only candy w/dispenser, but wondering if I’ll be allowed to personally hand to them; or do they just put all gifts aside for them to view later? Thanks SO much for posting your M&G guide with everyone’s comments..I “think” it has helped ease my nerves, knowing I’m not the only giddy star struck Gandma! Here’s a little secret. If the gifts are very small stick them in your pocket then hand your gifts to them. You will probably (remember “probably”) have to lay your purse and packages on a table. Rose Marie, I don’t know what they do with their gifts. They must feel so honored to receive them. I know I have seen them use some, a phone cover, a soccer shirt, etc. Knowing our guys, they probably donate some gifts to charity. Glad your gift is pocket-able. In CA, we gave each guy an Aunt Sally’s New Orleans praline with a note asking them to come to NO. They are!!! They were interested in the candy, since I don’t think pecan trees grow in Italy. Wow! I’m entering the countdown of days! I can wait to see these wonderful men perform in Cleveland on the 24th of February. 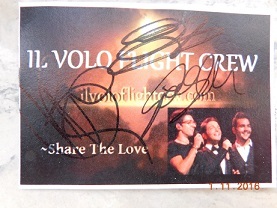 I will probably use both the badge and the lanyard from the Il Volo Flight Crew. I saw there are a couple of more Il Volo lovers that will be going to the Cleveland concert. I’ll meet you there. Thank you all for all the information, tips, videos, anecdotes, etc. on the wonderful Piero, Ignazio and Gianluca. The M&G info is great! I’m loving it. LOL I use both too! Have just the greatest time!!! I hope you have a great time at the Cleveland show. I’m from Mentor but in Florida for a couple of months. I have to wait until March 6 to see the boys in Tampa so you have a head start. I bought my tickets in August and this will be my first live show and Meet and Greet. I can’t wait. Have fun and give the guys a hug for me. Hope the weather is good for all of you. I will be wearing lanyard in Tampa, so if anyone notices, please say hello, my daughter-in-law and I have 2nd row seats. Loved reading this!! I have my concert and M&G on March 30th! Loved the idea of getting Igna’s cologne. Does anyone know what cologne Piero wears?